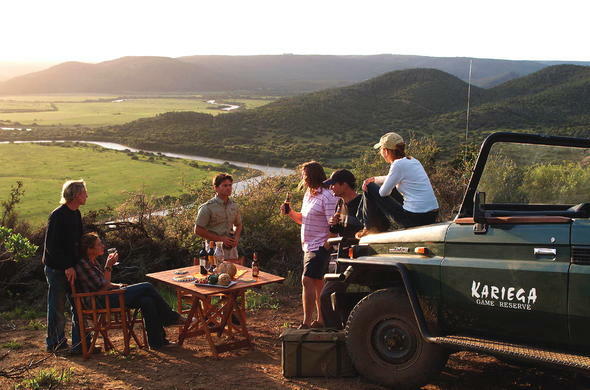 Kariega Game Reserve offers exciting walking safaris, Big Five safaris in open 4x4 vehicles as well as tranquil Kariega River cruises and spa sessions. Kariega Game Reserve in South Africa offers guests a diverse array of activities like canoeing, fishing, walking safari's, a wilderness fly camp and Kariega River cruising. Plentiful game allows for exhilarating Big Five safaris packed with sightings and activity, ideal for a thrilling Eastern Cape holiday. In between safari activities on this Eastern Cape game reserve, guests can relax and rejuvenate body, mind and soul. The Wellness Centre at Kariega Game Reserve offers a range of treatments and therapies, including relaxing or energising massages, facials and the like. Ideally positioned to service all the game lodges, the Wellness Centre is situated at Kariega Main Lodge (and also close to Ukhozi Lodge). The Centre comprises 2 treatment rooms and a well-equipped gym. Treatments for River Lodge guests are provided in the comfort of their own suite. Guests at this Eastern Cape game reserve in South Africa can enjoy a relaxing cruise down the Kariega River on the spacious Kariega Queen, while delighting in a refreshing sundowner on the deck and viewing the unspoiled scenery. At Kariega Game Reserve, safari guests can view African wildlife in their natural habitat from luxury open 4x4 vehicles, accompanied by experienced rangers. Guided walking safari's at Kariega Game Reserve allow guests to explore this beautiful region on foot accompanied by one of the reserve Rangers. Experience the raw beauty of the bush while sleeping out under the African stars in a seasonal (September to May) tented wilderness fly camp. Set out on an afternoon game drive with an overnight bag packed with the essentials. Go on a leisurely cruise on the Bushman’s River and go on an exciting guided walk. Delight in a tasty meal around the campfire and discuss the day’s adventures before retiring to your tent and falling asleep to the gentle sounds of the bush at night. In the morning you’ll have a game drive in one of the remote parts of the reserve where game viewing is excellent, before returning to the lodge for a hearty brunch. Kariega boasts more than 280 bird species. The range of birds includes nesting Martial, Crowned and Fish Eagles. Tranquil moments can be enjoyed whilst gently paddling along the Kariega River and Bushman’s River with a canoe. Safari guests have opportunities of spotting African Fish Eagles. Guests at Kariega Main Loge and Ukhozi can bring their fishing gear and cast a line in picturesque surroundings on the banks of the well stocked Kariega River. River Lodge has fishing equipment available. Golf enthusiasts can enjoy peaceful hours on the greens at the well known Royal Port Alfred (Gary Player designed) or Fish River Sun Golf courses. The golf courses are situated within 25-40 minutes of the reserve. The golden beaches of Kenton-on-Sea are a short drive away, making Kariega Game Reserve an excellent bush and beach destination with river activities to top it off. Kariega is situated in the heart of 1820 Settler Country with regional highlights and fascinating sightseeing in Grahamstown, Salem, Bathurst and Port Alfred. All hold strong significance in South Africa’s history. Enjoy relaxing spa treatments like massages or facials at Kariega. The Wellness Centre at this Eastern Cape game reserve in South Africa offers 2 treatment rooms and a well-equipped gym. Guests can delight in pure relaxation while spotting African Fish Eagles from their canoes. Big Five safaris are also on offer at Kariega.